an eruption of pruritic macules with small central vesicles at the orifices of sweat glands, accompanied by redness and inflammatory reaction of the skin. An eruption of papules and vesicles at the orifices of sweat glands, accompanied by redness and inflammatory reaction of the skin. Synonym(s): heat rash, prickly heat, strophulus, tropical lichen, lichen tropicus. The rash often improves after the patient returns to a cooler climate or the affected area is cooled and dried. 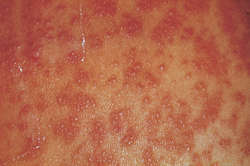 A form of miliaria seen almost exclusively in the tropics, frequently following attacks of miliaria rubra. The affected area is covered with pale, firm, painless papules 1 to 3 mm across. These papules do not cause itching. Miliaria rubra ("pricklyheat") is caused when keratinous plugs occlude the sweat glands. Miliaria rubra manifests as superficial, erythematous, minute papulovesicles with nonfollicular distribution. Acral papular rash in a 2-year-old boy: was this rash linked to the patient's recent viral infection? 13 other dermatoses were observed in the study, where scabies was found to be commonest (16%), followed by fungal infections (14%), bacterial infections (5%), viral infections (9%), acne vulgaris (13%), miliaria rubra (4%), drug rash (1%), urticaria (2%).